As we wrap up a July filled with the month's sparkling birthstone, the regal ruby, it's time to gaze at one more ruby tiara from a reigning royal family: the unusual and striking Ruby Peacock Tiara from the Dutch royal vaults. The tiara itself was made in 1897 by Schürmann during the reign of Queen Wilhelmina, though the rubies in the piece were apparently owned by Queen Sophie, who died in 1877. The central peacock element is detachable and can be worn separately. 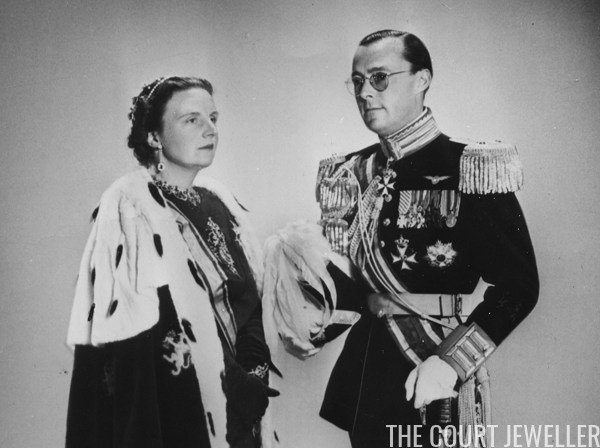 The suite also includes a large brooch and a necklace, which was worn by Queen Juliana at her investiture in September 1948. 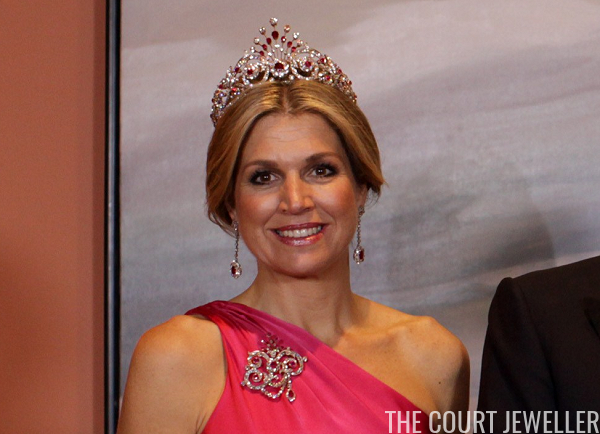 Most of the Dutch tiaras are a part of a family foundation designed to keep the royal collection intact. However, this piece has floated around within the family a bit. 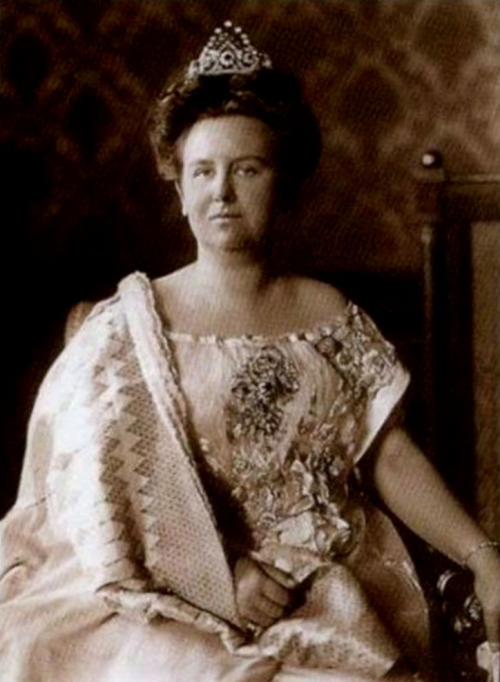 Wilhelmina gave the tiara to one of her granddaughters, Princess Irene (sister of Princess Beatrix), even though she’d scandalized the family with her marriage to Prince Carlos of Bourbon-Parma. Irene wore the tiara for years, and then it disappeared from public view for some time. 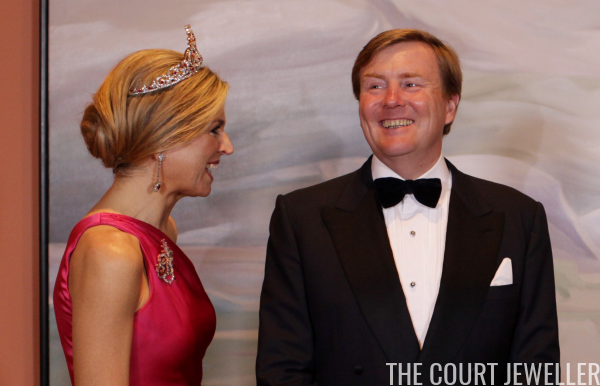 But it’s quite possible that the tiara has finally found its way into the family foundation, because it has found its way back onto Dutch royal heads. 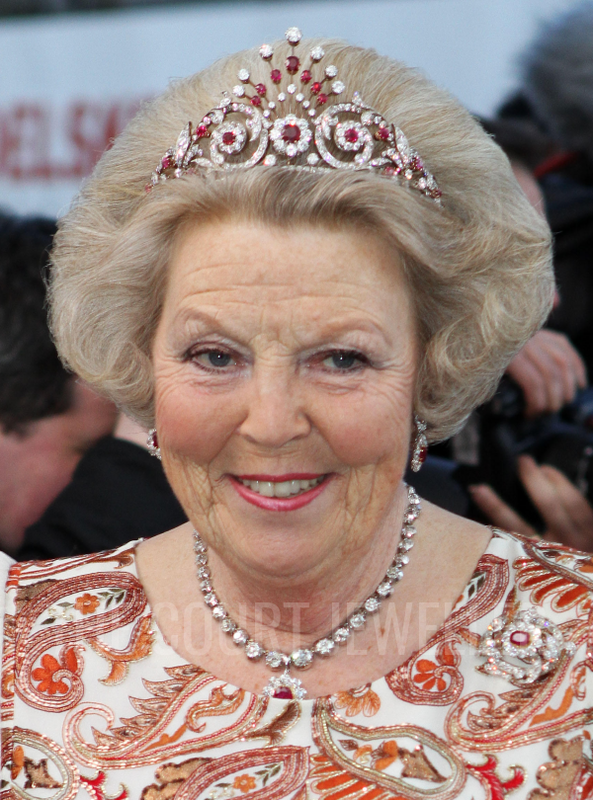 Both Princess Beatrix and Queen Maxima have worn the tiara several times. 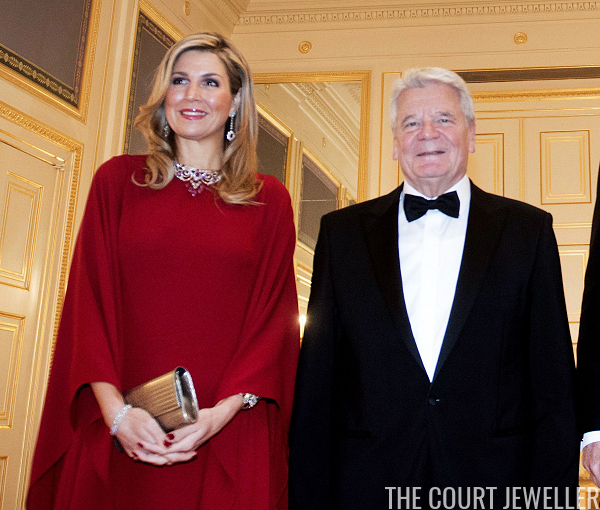 One of Maxima's first major appearances in the tiara came during a state banquet in Oman in 2012. She's also worn it for state dinners since, including banquets in Poland and Canada. And she's also worn the brooch and the necklace from the suite. The necklace and the tiara are very similar in design, and some have expressed that it's difficult to tell them apart. 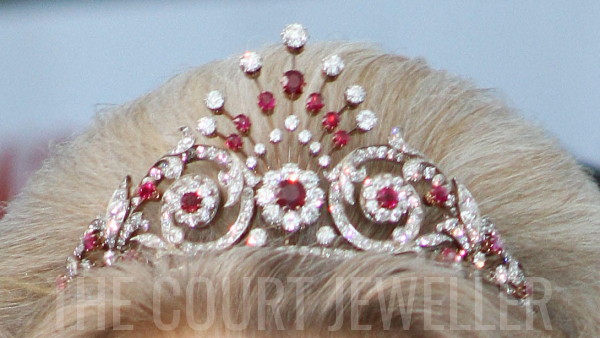 Here's the easiest way: in the "peacock tail" portion of the design of the tiara, the top stones are diamonds; in the necklace, the end of the "tail" (which faces toward the wearer's toes) is set with rubies. Happily, it seems this rogue tiara has found its way back to the palace rather than taking the usual path, which often leads straight to the auction block.